More than twenty JCB machines have made their film debut in the new movie Alien Covenant, the latest instalment of the Alien film franchise. JCB supplied skid steer loaders, Loadall telehandlers and JS series excavators to 20th Century Fox for the making of the new film which opens in Australian cinemas on Thursday May 18. The new movie was filmed at Sydney’s Fox Studios, and JCB utilised the help of Australian JCB dealer Construction Equipment Australia to deliver the fleet to the studio. Six JCB generators were also supplied for use in the filming. Alien Covenant is set 100 years in the future and follows a group of space explorers as they attempt to colonise a new planet. 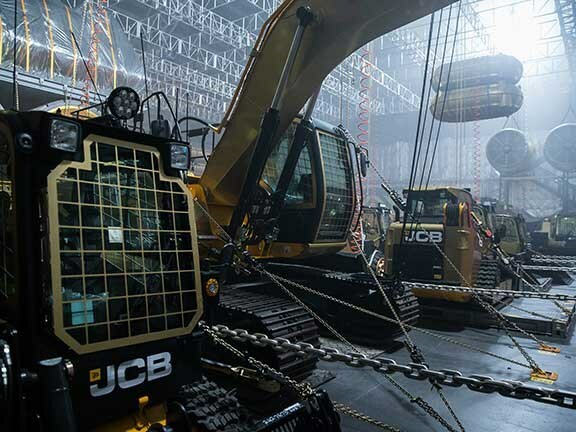 In the film the JCB fleet works in a ‘terraforming bay’, where they work to alter an alien environment to make it habitable for human life. The machines are decked out in a bright gold colour. The gold was the idea of the film’s British director Ridley Scott, who wanted to give the machines a more ‘futuristic’ look. "This is the biggest product placement exercise in JCB’s history and involved more than £1 million (approx. AU$1.7 million) worth of machines," JCB worldwide marketing director Michael Plummer says. "Ridley Scott’s idea to wrap the machines in gold delivered a stunning result and is certainly an eye-catching addition to a film which will be seen by millions of people around the world."